Cannot believe this is a F21 dress! Kate Spade had a similar one this spring. You look so pretty and preppy in this look...LOVE! Cathy, your Poor Little It Girl! I love the striped dress and the V back! This dress definitely can be worn to so many occassions (baby and bridal showers come to mind) and no one has to know it's a F21 find! Ooo, so cute! 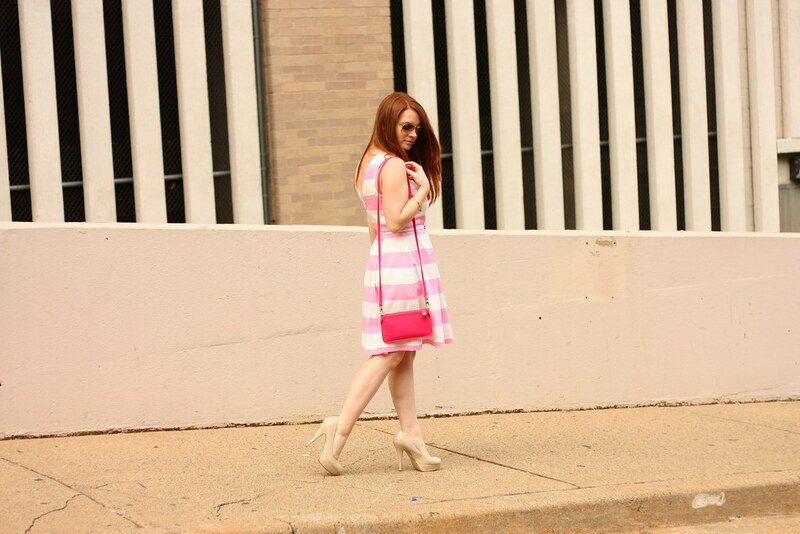 Love the pink stripes on you! This is one of those pieces that doesn't look like Forever 21...my favorite. This does NOT look like a F21 dress! I love the stripes and how well you pull of the pink. Supes cute! I agree with Sara.. it looks like a high end dress for sure!! You look great in it! I loved this dress on you - it looks so much more expensive than Forever 21! Not feeling this dress on you...looks better on taller girls.